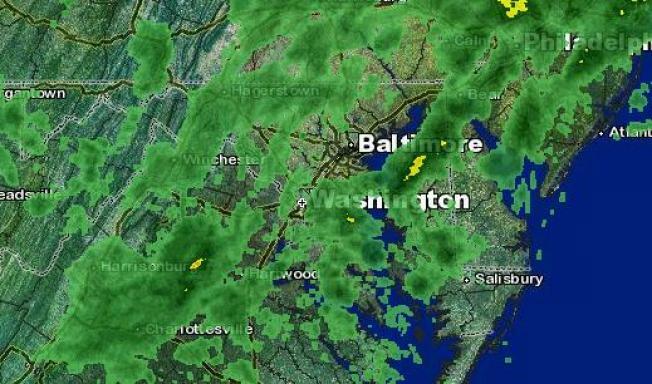 Storm Team 4 Meteorologist Chuck Bell says the majority of the D.C. metro area will stay clouded and rainy throughout the day Saturday -- but the sun will be back Sunday. Bell says temperatures will linger in the 70s and low 80s throughout the day, with possible thunderstorms in the afternoon. Don't expect downpours but be ready for a sprinkle or two all day. Sunday, winds will pick up slightly but the sun will be out, making for a perfect day in the low to mid 80s. The area has gotten above average rainfall since June 1 -- 14 inches in all, which is 7 inches above average -- so Saturday's rain isn't all that necessary.